I am a Physical Therapist with over 30 years of work experience, licensed in the State of Montana. 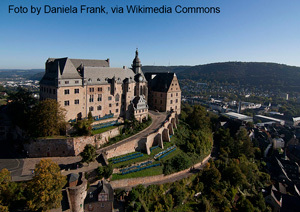 I graduated from the Rudolph Klapp School of Physical Therapy at the University of Marburg, Germany (down below the Marburg Castle in the photo to the right). Over the course of my professional career I advanced from staff PT to Senior PT in a chronic pain program, which I helped to develop. Later I became Director of Rehabilitation in a Long Term Care Facility with a Head Trauma Rehabilitation program. After taking my first class in CranioSacral Therapy in 1999, I opened my own private practice, which gradually evolved from PT into a Holistic Health practice based on body work. and there is more to come every year! Visceral Manipulation 1A and B.
I am a Techniques and Diplomate Certified CranioSacral Therapist, a Certified Teaching Assistant, and a Study Group Leader with the UII. I organize and lead the only annual 4 day SER study group retreat in the US, which takes place in Boulder Hot Springs, Montana, in May. I have participated in a Mentorship Program, receiving one-on-one mentoring from a UII teacher. Aside from the UII, I received formal training in energy work as Therapeutic Touch, to level 3, through the Carroll College Nursing Program. I also studied Myofascial Release with John Barnes.